This is a post that has been a long time coming. I kept on holding it off until I had a good variety of miso on hand to show photos of. I can't say I have a comprehensive selection to show you, but I hope you will find this article useful anyway. Miso　（味噌、みそ), as you probably know already, is a naturally fermented paste made by combining cooked soy beans, salt, and often some other ingredient such as white or brown rice, barley, and so on. The texture can range from smooth to chunky, and the color from a light yellow-brown to reddish brown to dark chocolate brown, and the flavor ranges from mildly salty and sweet to strong and very salty. It is packed with umami and protein, not to mention all sorts of nutrients. Miso-like fermented bean products and pastes exist all over Asia, but here I will mainly limit myself to the most commonly used Japanese misos. The color can be a fairly good indicator of the strength of flavor, age and saltiness of the miso. Generally speaking, the lighter in color of the miso, the sweeter (less salty) it is. Light colored misos are also younger than dark colored ones in general.There are exceptions to this rule, but if you are confronted with a selection and don't know which way to go, it's useful to remember. Shiromiso (白みそ）or 'white' miso is the generic term for golden-yellow to medium brown miso. It is milder than other kinds of miso, with a slight sweetness. It's the most versatile one for cooking purposes - you can use it for miso soups, miso marinades, and so on. If you can only afford one kind of miso budget-wise or space-wise, get a good shiromiso that is labelled 'medium sweet'. Akamiso （赤みそ）or 'red' miso is the generic term for miso that is a dark reddish-brown in color. It is usually (but not always!) more salty and assertive in taste than shiromiso. If you see a red-brown miso that is labelled a inakamiso (田舎味噌）or 'country' miso, you can be pretty sure that it will be strong in flavor and fairly salty. 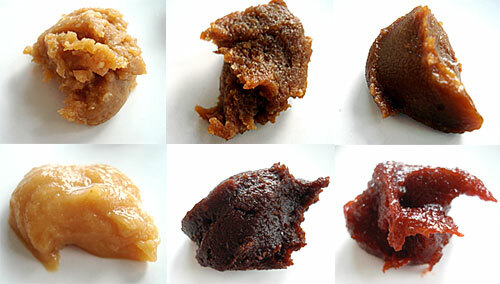 Awasemiso (合わせ味噌）or 'blended' miso is just that, miso that combines two or more different types of miso together. This is also a good general choice if you don't want to assemble a miso collection. Since miso is so often used in conjunction with dashi stock, some misos already have dashi added to them. These are usually labeled dashi iri （だし入り）. If you want to add your own homemade dashi, or you are a vegan and want to avoid any fish products in your miso (see vegan dashi), look for additive-free or mutenka (無添加）miso. If you can't tell from the label whether it has dashi or not, look at the ingredient list - an additive free miso should only have soy beans, salt, rice or barley if they are used, and perhaps some fermentation ingredients (usually listed as koji (麹)). Unless the miso contains barley (麦、mugi) or wheat (小麦、komugu) it is gluten-free, unless it has some not-traditional additives. You may see a number of 'brand' names for miso, such as Shinshuu, Yamato, etc. Most of these names don't really mean much except to indicate where the miso comes from - the differences are too subtle except for a diehard miso connoisseur. There are a couple that stand out though. Hatcho miso （八丁味噌）is a type of miso made in the Tokai region (now the 3 prefectures of Aichi, Mie and Gifu). It was traditionally said to have been served to the emperor and is held in high regard. It's an all-soybean miso, which is about medium on the sweet/strength/saltiness scale, and is a good general purpose miso. These are not pure misos, but are sauces or blends with miso. Sumiso (酢みそ）is miso with added vinegar, sugar and mirin. It's used as a condiment, marinade, and so on. Miso blend for marinade, or misozuke (味噌漬け）is miso with added mirin, soy sauce, konbu seaweed, and so on. Commercial blends often have MSG or "flavor enhancers" in them. How to get a good miso? As with many things in life, generally speaking the more expensive a miso is, the better it's going to taste. Do be sure you are comparing like-to-like when looking at prices though. Generally, special misos like Saikyo miso, or ones with special additives like brown rice miso, tend to be more expensive than general white, red or blended miso. Also, organic/additive-free misos tend to be a bit more expensive. The only way to really know if a miso is good or not is to taste it. So, if you are trying out a new to you miso, try to get the smallest package possible and try it out. You may think me prejudiced, and I probably am, but I do think that miso made in Japan generally tastes better than miso made elsewhere. Not to name names, but I've tried some non-Japanese brands, and they are lacking in depth of flavor, even if they are sometimes more expensive! The top row shows the three misos I use the most: two types of shiromiso, and an awasemiso. One shiromiso is a big chunkier in texture and has brown rice in it; the other shiromiso and the awasemiso are both all-soy bean types. I use any of the three for most if not all the recipes here on Just Hungry or over on Just Bento. There's no good reason for me to have two shiromisos and an awasemiso - I just like trying out stuff. The second row shows misos I use a lot less. On the left is a Saikyo miso, and in the middle is some quite salty-strong akamiso. I use Saikyo miso in some baking experiments and as a sauce to go with stewed daikon radish and such. The red miso is used for some marinades and some miso soups. Lastly, since I had a square to fill and I only have 5 kinds of miso on hand at the moment, I've included some Korean gochujang (or kochujang as it's pronounced in Japan), although it's not a miso at all. It is however a fermented soy bean paste with added wheat, spices and so on.As you can see much redder than the 'red' akamiso - since I use it almost as much as miso because I love it so much. What actually prompted me to finally post this was an article I saw elsewhere that was titled What Is Miso Paste? It stated that miso and rice for Japanese people are like 'meat and potatoes for Americans'. Heh? Sure, miso is part of Japanese cuisine. But you do not always eat miso, or always have miso soup, with a meal, if that was the analogy they were trying to use. Sure, soup is often served with a meal in Japan, but it can just as well be a clear soup as a miso soup. The real basis of Japanese cooking is rice, dashi and _sa shi su se so_. If you whittle it down to the bare essentials, a bowl of plain, white rice and something salty to go with it makes me feel Japanese through and through. But enough of my whinging. If you have any questions about miso that I haven't answered here, ask away! Submitted by maki on 2009-10-23 10:58. Great info. Thanks for such an excellent article. Thank you for this long-awaited article! Halfway through reading it, I had to pull my new bag of miso from the refrigerator to compare the label with your list of types. Mine is shiromiso, from Japan, repackaged in San Francisco. My previous bag had a darker color and, after more than a year in the refrigerator, I tossed it out. While following your suggestion for making miso soup for bento use (heat water, mix in bowl with miso carried wrapped in a bit of plastic wrap) I also found out by experimenting with quantity that for me more miso is not better than less miso in a cup of soup. And, I had thought that kochujang was just another chili paste. Thanks for the useful information on your site. I know this post is really old but. . .I am shocked you threw out precious miso. : ( I have had mine in the fridge for literally years. Not only is it preserved by the large amount of salt in it, it is rather self-preserving. Only super high heat is able to destroy the enzymes and cultures as I understand it. I have never seen miso with mold or any problems but others may have. I get my organic miso from Natural Import Company online. Think about how it is and was made in Japan for centuries. No refrigeration and fermented for years in wooden vats! Just sayin'. Heh, ironically I was just thinking about miso because I am just about to start my own miso fermentation experiment. Oddly enough, I was able to obtain koji (the aspergillus starter) at one of my local Chinese markets and now I'm just trying to get a suitable container for the fermentation. Not sure how well this whole thing is going to turn out as it's rather dry here in Arizona but lately the weather is getting slightly cooler so at least I don't have to worry about frying my microbes! I'll let you know how it turns out! Which Chinese market di the koji come from? Which Chinese market did you get koji from? I would love to get some here in SF. The only place I know is mail order through g.e.m. culture. Thanks! When I first started cooking with miso, I didn't really know the difference and was overwhelmed at the supermarket. Without knowing it, I ended up buying some shiromiso. Since then, I read up on it and have tried various kinds of shiromiso (there is a brand that we prefer), and other brands of miso not made in Japan (including two which are made in USA, one has chickpeas in it). I have read info about saikyo miso but have not been able to find it yet at the store. There are just so many brands of miso out there, the best like you said it to experiment with them. I loved your article, along with the great photos. There are thousands of miso brands out there and sometimes its hard to decide just which one to buy, it really helps a lot to have some guidelines! Miso is for the Japanese like what MEAT and POTATOES is for Americans?? Thats an audacious comparison! I´ve got a question. I´ve found that some makers label their miso as NAMA (生) or RAW. What is that supposed to mean? I once tried NAMA Soy Sauce and it was good beyond words! NAMA BEER is also good. Namamiso means that the miso has not been heat-treated to stop the fermentation process (many manufacturers do this to stop the miso from 'breathing', which can make the container swell up and things). So it's 'living' miso - which means you do need to use it up a bit faster since it will continue to ferment and change. I see! So...Nama Miso continues to ferment once you open it. That probably explains why some miso I've had in my fridge for some time has started to develop alcohol aromas. Its still edible, but doesn't taste as good. I have several jars of unpasteurized miso that I left in the pantry and forgot about for 3-plus years. When I open them now they are slightly alcoholic in smell. I find that it is still edible too. This is great! Thank you so much for this. I've ALWAYS wondered about the differences in miso and have never known. I'll be bookmarking this thread for sure! Thanks! This is really great information. thank you for sharing this. How sad I am to know that you can keep miso that long without ill-effect. I just threw a big pack away because I had had it open in the fridge for over 18 months! I'll be keeping an eye out for moromi miso too. My host mother used to serve that with cucumbers all the time, but when I have tried to do the same with regular akamiso, the taste was far too strong. I guess I know what to look for now! great post, thanks for the info. Have you heard of bakke miso? I was in Tohoku near Kurikoma in Miyagi, and had something with this name inside onigiri. But none of my Japanese friends seem to have ever heard of it. Perhaps i heard it wrong, but i thought that's what it was called. Any thoughts? I didn't know of it either, so I googled it and there it is! You learn something new every day :) Bakke miso is apparently is a Miyagi prefecture speciality made in the spring, by cooking butterburr sprouts (fukinotou) in a sweet miso-based sauce. Here's a recipe in Japanese with photos: Sounds delicious! Thanks for that informative link to the recipe. I tried making bakke miso from a Kyou no Ryouri recipe before but missed the precooking of the fuki no tou stage. It was terribly bitter and not very edible, even with extra sugar. It seems so obvious now... Do you know any other ways to prepare fuki no tou? I haven't seen many ideas for it. My mother likes to blanch fuki no tou, then cook it in the standard dashi-sugar-soy sauce combination. You do need quite a lot of sugar to counteract the bitterness though. Most of my favorite misos come packaged in heavy plastic bags. This is fine when they are almost full, but by the time you get to the middle or bottom, it's a mess to measure out. And no matter how careful I was to scrape the sides, I'd end up with dried bits inside the bag. Cutting the bags down and then sealing in a ziplock bag helps, but now I just re-package the miso into plastic containers with the label stuck on top. I use Saikyo miso to mix with other saltier misos. Very good idea, re-packing into a plastic container! I often see in articles about being frugal in Japansese women's magazines that cutting the bag carefully and them plopping the whole contents into a container is the best way to ensure you get every bit of it out. Interestingly, I was just reading a recipe that calls for a type of miso called tokkara and I was curious about it. I live in Boston and we have a good variety of Asian (and even specifically Japanese) grocery stores, but I've been unable to locate it. I've heard that it's a specialty of a certain region of Japan, which may explain why it's difficult to find. In any case, is there something similar that might be easier to find? Or could I make something that's similar? Thanks! I've read your blog for a long time and made many wonderful meals as a result (I am loving the pumpkin miso muffins right now! ), but this is my first comment. Ah, another regional speciality miso! :) This time though it seems it is one that is aged with the added ingredients (green chili peppers, plus often yuzu) and it's a speciality of the Shinshuu (信州）region (modern day Nagano prefecture and environs). Regional specialities like that unfortunately aren't sold much outside of Japan...you'd have to get someone to smuggle some home with them if they go there. hiiiiiiiiiiiiiiiiiiiiiiiiiiiiiiiiiii. thanks for the information! i was at the asian grocery and i wanted to buy some miso, so your info came in handy! hahaha. anyway, while i was there i saw this seasoning, which was in liquid form, it started with ryo and i dont know what it ended with. but anyway, i was interested in what it was, because it was in a liquid form! do you know what it is, and what its used to cook with? hmm...this time I'm stumped. Ryo could be a lot of things...how did the liquid look and what were the ingredients? hmmm, well the brand i was interested in came in a clear green plastic bottle, but other brands had clear bottles and their liquid was coloured like white wine. but i'll remember to write it down the next time i go to the supermarket! Perhaps 料理酒 (ryōri-sake), which is simply seasoned sake for cooking? I have some that comes in a clear green bottle, and sake is about the color of white wine. I read the previous comments about putting the opened miso in container or zipbloc bag and just wanted to share what I do. I used to leave the miso in the plastic bag and it dried out a bit and I got some wasted miso. Now, whenever I buy a new package, I open it and plop all the miso in a glass container with plastic lid. Once the miso is in the container, I smooth it and also before putting the lid, add a plastic saran wrap film and then close the lid. Have not had any miso wasted that way. Am really enjoying the saikyo miso by the way. I ate some the other day with raw carrot. Thanks for the informative post! What varieties do you typically use to make miso soup? It may be worth noting explicitly that the Korean gochujang (고추장) is actually a red pepper paste closer in taste to hot sauce (which you know because you use it a lot). For those yet to be initiated into the joys of Korean cuisine, this spicy and slightly sweet paste is unique to Korean cooking and bears little resemblance to miso, except perhaps in viscosity and in the fact that it also happens to be fermented. It's the red stuff that comes in the bowl of bibimbap. Yum. What do you use your gochujang for? I mostly use a midrange white miso for miso soup, since we have it fairly often and miso is expensive here! I use kochujang/gochujang in stir-fries, in bibimbap of course, in soups, noodles...just out of the container... :P I really love it! Thanks for the post. I was just at the store last week staring at the shelves of miso trying to figiure out which to buy. I did narrow it down to non-gmo, non-msg, and low salt but I was overwhelmed b/c there were several like that. I honestly stood there for 5 minutes trying to figure it out. My little 3 year old patiently waited. I bought some shiro miso in the mid-priced range and it's good. I love your site b/c it provides so many recipes using miso. Good, I thought I was the only one still digging into that tub of miso three years on from opening it! Your article is useful, thankyou, and friendly too. I came across your writing whilst searching for a recipe for Miso Potatoes. I still haven't found it but feel much more informed about the ingredients. Would you have a receipe up your sleeve? Curious about Pre-Packaged Miso specifically for Soup. Ever since I got to Japan, we went through some organic "Made in Japan Only" miso snobbery. ;) My husband really loves red miso, so we'd use that and add homemade dashi for soup, but it finally got to the point where the flavor, for me, was not the kind of sweet flavor I had come to love from restaurant style miso soups (which I guess are probably horribly cheap, mass produced misos, but I still love the sweet flavor!). Re: Curious about Pre-Packaged Miso specifically for Soup. Check with Natural Import Company online. They have great miso of all kinds and all organic and live as I recall. I buy from them all the time and have never been disappointed. I recently made and posted a picture of my results and a link to your recipe of the miso marinated asparagus. A friend of mine on LJ who is allergic to soy posted back she made the recipe, only she used a miso paste made with adzuki! I had no idea such a thing existed, I'm wondering what that tastes like. I know adzuki can be kind of bitter unless you get rid of the skins and add sweetener....have you ever heard of this adzuki miso? I have heard of it, though I've never tried it. It's sold mainly by mailorder in Japan, as an alternative to regular soy and rice based miso. I don't know if it's available outside of Japan yet, but it's likely a natural food type of store will pick up on it sooner or later. It's said to be not as sweet as regular miso, which is not surprising if it doesn't use rice (fermented rice = kouji accounts for much of the underlying sweetness of regular miso). I had some great BBQed Harami Beef strips recently that were marinaded in a Red Miso paste with sugar and I wanted to create this myself. I recall the marinade had more of a liquid texture so was wondering if something may need to be done to the red paste to make it more of a liquid marinade texture or it will break down on its own. Just wondering if any suggestions since new to working with red miso paste. You might want to mix some sake and/or mirin, or if you don't have those sherry, with the miso and sugar. The moisture in the meat will come out (due to the salt in the miso) and make the marinade more liquid too. Also see my recipe for miso marinated pork on Just Bento. Thanks for the info, I've just recently purchased my first shiromiso. Although, I do wonder at what it is about GM foods you dislike? Very nice article. Definitely going into the bookmark list. One question though. Do you have any ideas or suggestions as to what would be good for a newbie to miso? I've never, knowingly, had it before and am looking for a way to ease into trying it, as I've heard before that it can be a bit of an acquired taste. wonderful infos about different types of miso, thanks! I went to Japanese restaurant, and tried raw salmon salad with miso dressing. The dressing taste a bit spicy like tobasco and red in color. Do you know what kind of miso is it, perhaps the recipe? I haven't tasted it yet, either. But I WILL, using one of your awesome recipes. Thanks! Did you know someone posted a song onto the internet asking exactly this same question? The photo on flickr shoes a slightly different kind which is described as "medium sweet"
Guess mine's just a really dark kind of "white miso" then. I saw the lighter one you linked to as well as a very dark, reddish one in the store where I got mine, but bought the medium one because I needed a good, all-purpose mise, and don't use enough miso to have several big packages in use at once.. I do wish I had bought the lighter one, though, as I really want to try a sweeter, less salty kind of miso, and miso isn't all that easy to find here in Denmark.. The package I'm using right now is labelled as "Marufuji miso" in roman letters. Google told me there's a wrestler called Marufuji, but I found nothing about a kind of miso called Marufuji, unless it's named after the wrestler, I guess. :b It looks rather like the new one I got colour-wise though, so I guess it's a medium-sweet shiro miso as well. After recently moving to London, where there are surprisingly few Asian people and next to no good asian grocers, I picked up a bag of that Clearspring miso mentioned here, from the one sad shelf of "Japanese" food at my local branch of Whole Foods. I was a little skeptical, having never purchased a non-Japanese Japanese ingredient. Now I'm NO miso connoiseur, I'm not Japanese, but even to me... wow! I had no idea what I was getting into as I made my first miso soup with this stuff, adding the amount I normally would of my good old brand back home. I can only describe it as literally painful. Salt soup! No flavour whatsoever, just salt pain! And I love salt! The whole bag went right in the trash and I made the hour and 15 min. trip to Japan Centre to rectify the situation. I wholeheartedly urge all who read this to never venture down the sordid lane that is Clearsprings miso. What a disgusting product! I love all your blog posts and japanese... Everything! This article made me want to try the 西京味噌 so badd. By the way gochujang is a Korean condiment but it's red pepper paste, not fermented soybeans... I think you were meaning to say dwenjang. Well, the best way to see if it has spoiled is to open it up and sniff it. If it tastes rotten or off in any way it probably has spoiled; if not, give it a taste and see if it's edible! I have no idea why it changed color since I haven't seen it myself. I already experimented with miso a little bit and wanted to have some shiromiso to compare to the akamiso I had used previously. I didn't think about it a lot since I thought that most Japanese products are rather naturally made and that I had to try several brands to get an idea how good miso should taste for me. So I bought some "light" shiromiso in my local Asia store. At home I read the list of ingredients: Besides "normal things" like salt etc. there is MSG and color in there as well. Is that an indicator for a "bad" miso? I enjoy reading your blog a lot and I never came over any too salty or tasteless recipes (when I thougt there lacked salt, soy sauce etc, I just added it; maybe this is why). I'm really glad that someone makes such an effort to bring Japanese cooking to the world. Thanks a lot! The miso you have is most likely the type that has added flavorings and is sold as 'ready to use' without adding dashi stock. That accounts for the MSG. Not all Japanese products are good and 'natural' - you still have to look at the ingredients I'm afraid. Organic miso that I get from Natural Import Company has no MSG. Organics don't use it. My hubby is very sensitive to MSG and has a very bad effect if he has it in his food. Good aged miso needs no MSG. Hi Maki, I've a tub of 西京味噌 that is going to expire end of Feb. As I only cook once every two weeks, I need to find a way to quickly finish it up. Do you have any recommendation of how to use the miso up quickly? Perhaps something like a sauce etc which I can make first and freeze it up and keep till after Feb? Many thanks for your help! First of all the miso will probably be perfectly fine after the expiry date - which is more of a 'best by' date rather than 'eat at your own risk beyond this point' date. But if you want to use it up anyway, make it into a marinade for fish filets or meat (pork or beef filets). Use the method described here. You can omit the ginger if you like, and the sugar too since saikyo miso is already pretty sweet. I've been eating/cooking all kinds of miso without paying much attention to them. I knew they can be light, dark, sweet, less or more salty but that was about it. Hi. I live in a small country where too find Japanese related stuff is really really hard. I was really lucky to find some kind of miso paste in a small Asian store. It was the only miso that they sell. The whole package was in Japanese with a white sticker on the back. On the sticker was explanation of the miso in my language. But still, not enough information for me. In the ingredient list it was written: 60% rice, soy beans, salt, water, alcohol. I fought that it was a strange ingredient list. I've wrote some Kanji on a paper (how to read from what soybeans it is made, and does it have MSG or dashi in it) and went the other day. But I couldn't find any of them on the package. I really wanted to make miso. But I am a bit afraid to buy it. Don't really know what to do. Maybe you could help me? I was even thinking of taking a photo of the package. I made my first miso soup today. I have had the 'flu and lost a bit of weight and felt this was really the time to re start my attempt at an Okinawan diet. I did not have any fish stock so as a basis for my first miso soup I used a pack of chicken noodle soup, added mushrooms, wakame seaweed, sugar snap peas, tofu, and a tablespoon of shiro miso in probably .75 liter of soup. I found it very salty, but maybe because I started with the chicken noodle soup that would have had salt in it too. Anyway, my question is, how long can I keep the made up soup now? I understand it would normally be made in bulk and used over time, but not sure if that is after the miso is added? What percentage of miso sold in the states are unpasturized? If my miso doesn't say Nana, or otherwise indicate if it is raw vs pasturized, is it a good bet it has been pasturized, or is it just the other way around. I ask because I love whole foods that are still microbiologically active. It's a problem in the USA with the tough pasturization regulations. Just found your wonderful article on miso through a link left by a reader of Mark Bittman's miso article today in the New York Times. He offers some inspired recipes using miso. For all you who wonder about miso that is past dated: my miso has sat neglected in the fridge since 2008! Now, with Bittman's article and this one, it will be put to good use. It looks, smells and tastes fine due to being stored in well sealed containers. Yum! Great article. I've been making and enjoying miso for years. We had a big pot of miso soup the other day with tofu, scallions, wakame seaweed, and soba noodles. At the table, I added a dash of sesame oil. I also enjoy miso on bread or crackers. I've recently been buying a more expensive, lighter, and sweeter variety. It doesn't matter as much for soup, in my opinion, but otherwise it's a huge improvement. In SF, we're so lucky to have Asian markets, Rainbow Grocery, and Cha-Ya (a vegan Japanese restaurant). As a vegetarian, I don't eat miso soup in restaurants very often, because it's typically non-veg. A bought a plastic package of Mitoku Brand Marukura Organic White Miso at a Macrobiotic conference almost 3 years ago. Sorry to say I've never opened it and it has been stored in the cupboard. I can't remember what color it was when i bought it but now it is a dark brown. After reading a lot of the posts it seems that since it is unopened it should be Okay to use but I am just wondering if white miso is sometimes brown or if it has changed color...any ideas? Great article thank you. But I have a health question. I read that longer miso ferments are healthier and since I'm fighting autoimmune disease I'd like to know which brand you would recommend for me. I have a shiro style by Cold Mountain (miyako oriental foods) and it says nothing about how long it's been aged, but we love the flavor. So if you could recommend a yellow aged miso id be grateful. I live in Japan and have recently bought two miso pastes. One is light red in colour and says something in Kanji with 100%. The other is darker brown and says 15%. I like the brown, 15% one better. Do you know what these numbers mean? I'm having a hard time matching the kanji. Upload a picture of the miso somewhere and I'll take a look! Better than guessing at what the numbers might be. Hi Maki; I've been enjoying your blogs and learning new cooking techniques. Yum yum Japanese food! Thanks for all the work you've been sharing with us. I often get the "health food store" chickpea miso because its made without soy. Very mild stuff. It is great on toast instead of butter! Next time I visit the Asian market I will look for organic Japanese miso...thanks for the info about that. Last year I made my own Gojuchang. Pretty easy and wow is it delish! A friend made some miso last year; it is tasty....on my list of things to do! Thanks again for your wonderful blogs. I know this is a late post but. . .You can add dashi if you want but it has probably been made so you don't have to. It is noted on the package for those people who don't want fish in their miso or are vegan. I sometimes make my own dashi just because I like it. Anyway, it is personal taste. Does anyone know of a company in Southeast Asia (especially Thailand), that produces organic chickpea miso? Thanks. it sounds to me like miso is just another form of soy sauce. Other than being thicker, how is it different? Hi! Very interesting info. here--thanks! My wife is Japanese and bought some Miso Paste at least 4 or 5 years ago, that has been in our refrigerator from the start and it still looks like the day she bought it--the plastic container has not puffed up nor is there any mould or anything growing in it, nor any odd aroma coming from it, and it's never been opened. The brand name is Hanamaruki (made in Japan), and it is a so-called white soybean paste. The ingredient list states: water, soybeans, rice, salt, and ethyl alcohol . It says 40% sodium for a 20 gram serving so I assume that's why it has not gone bad (so to speak). The package also states: Shinshu Shiro Miso Cup. We were wondering if it's still safe to use? Thanks for your reply!